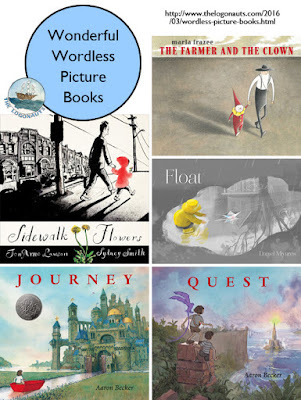 Wordless picture books are a wonderful sub-category of picture books, and many new, fabulous wordless books are now available. Wordless books appeal to a wide audience and should not be neglected once children have learned to read. Wordless books have much to offer and invite engagement by encouraging readers to tell the story themselves. 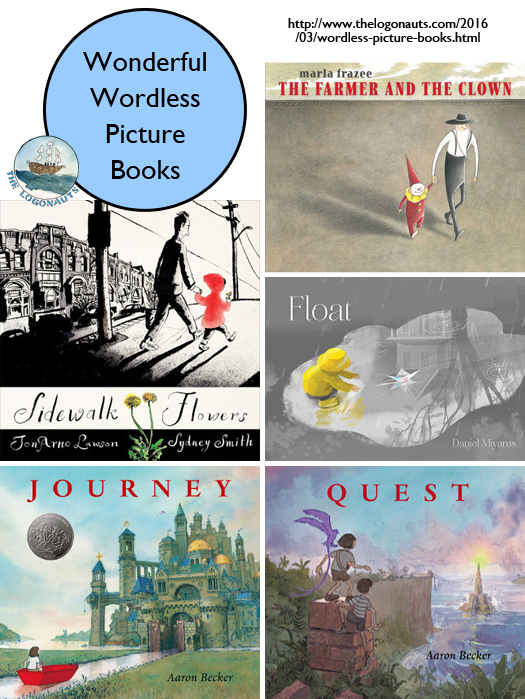 This post shares some of my favorite wordless (and near wordless) picture books from the last few years. 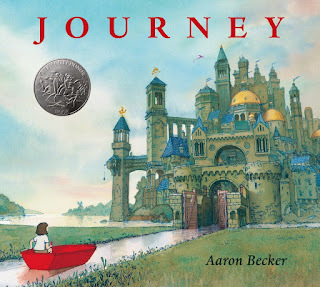 Journey (2013), a Caldecott Honor book, and Quest (2014) by Aaron Becker. In a sumptuous ode to Harold and the Purple Crayon, Journey traces the adventures of a young girl, armed with only her red crayon, who travels into an intricate imaginary world. 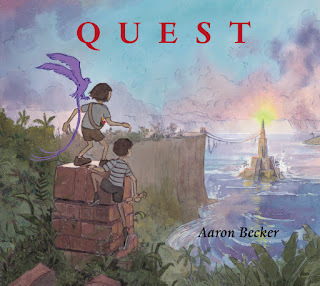 The magic continues in Quest where the girl and her new friend seek out other colors along the way. Both of these books are incredibly intricate, and I could spend minutes examining a single spread. These are worlds children will want to visit again and again. Float (2015) by Daniel Miyares. 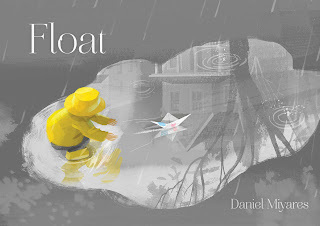 This charming picture book relates the events of a single rainy day. A boy folds a paper boat from the newspaper, brings it outside, and sets it free - with unexpected results! Several of my students are really into origami right now, so they especially enjoyed that the end papers contained directions for folding your own! 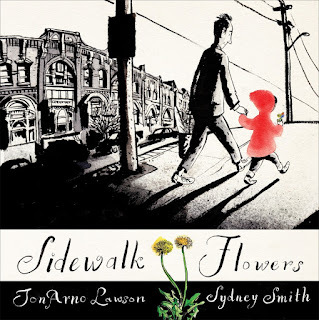 Sidewalk Flowers (2015), the Cybils Winner for Fiction Picture Book, by Jon Arno Lawson and illustrated by Sydney Smith. I was pleased to serve on the Cybils committee that chose idewalk Flowers for this year's award (read the full post here). This heartwarming story shows the importance of paying attention to details and seeing the beauty in the world around you. This theme is echoed by the color scheme that grows and spreads as the little girl shares her treasures with others. The Farmer and the Clown (2014) by Marla Frazee. This wordless picture book featured heavily in last year's Caldecott conversations, and the expressions of emotions is powerful. This was one of those books were I was completely drawn into the story while reading it, but after stepping outside of that moment. the whole thing seemed a bit random and odd. 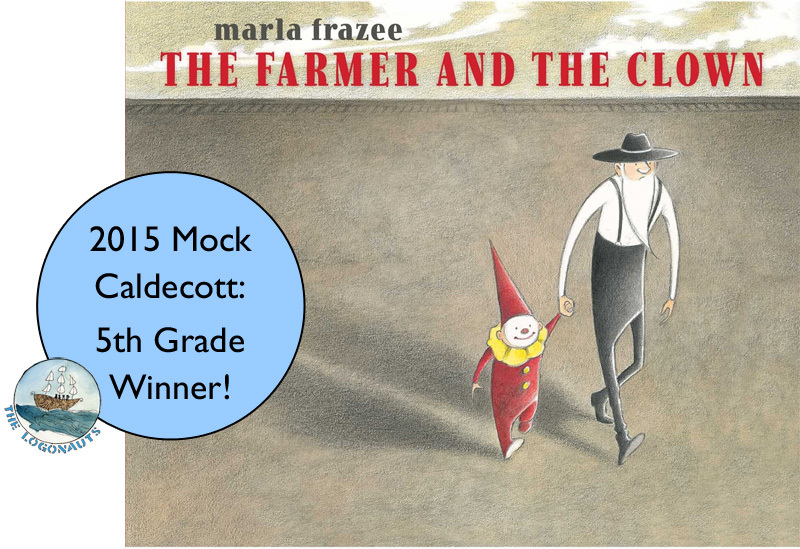 Our fifth graders chose this book as their Caldecott winner for last year's Mock Caldecott. Draw (2014) by Raúl Colón. This wordless picture book follows the imagination of the author as he travels to Africa and imagines drawing the animals that he sees there. Many of my students have been returning to this one again and again, and I could hardly stop laughing when one of them decided to give a humorous oral retelling of the story to several of his friends during break time. And, just because I couldn't resist, there are also some lovely books with very, very limited text that are also worth mentioning. 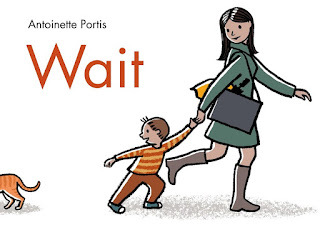 Wait (2015) by Antoinette Portis. The words in this book alternate between just two choices: wait and hurry. Swap! (2/9/2016) by Steve Light. A few weeks ago, I received a curious envelope containing a bright red button and the suggestion to try and swap that button for the greatest haul. My students and I enjoyed studying the cover art and speculating about the book. 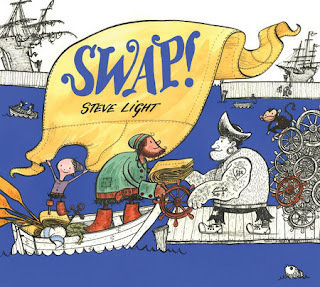 This charming, near-wordless tale, shows how a little ingenuity - and some clever swaps - can help out a friend. 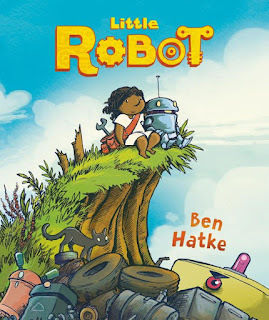 Little Robot (2015) by Ben Hatke. My students love Ben Hatke's Zita the Spacegirl series, so there was much excitement about his newest graphic novel. The book did not disappoint. This novel-length graphic novel is the nearly wordless story of a resourceful young girl who finds and befriends a lost robot. This is a very sweet story with minimal text, making it great for reluctant readers. Do you have a favorite wordless picture book that I missed? My son needs repetition of simple words due to his apraxia (speech delay) and also needs shorter versions of a story due to his attention span at the age of only three. I find myself rewriting the story of most books we read because of these two needs, so these picture books would be great! I look forward to future treasures you share with us at Literacy Musing Mondays! Thanks for your thoughts, Tami, and I agree that your soon will love these books. Definitely check out Wait too. Repetition + limited words + charming story! Thanks for highlighting this post this week, Beth!